The 14th Street Y recommends this inspirational theatrical production! Get tickets your tickets here! The 14th Street Y is committed to the fitness and well-being of your entire family. Though our Family Fitness Intensives had to take a break due to conditions from Sandy, this Sunday we’re back, and more fun than ever! Family Capoeira is a fun and energetic workout based on martial arts, dance and simple acrobatic moves. You and your kids will have a blast together and get a great workout at the same time! Family Capoeira is FREE for members. If you have a friend or two you’d like to bring with you, please contact Camille_Diamond@14StreetY.org. We can’t wait to Capoeira with you! The LABA Kids All Star Cast comes to the 14th Street Y this Sunday! This event is part of the LABA Kids Sunday series, and we sat down for an interview with one of our all stars, storyteller Jake Goodman. What is your role in the LABA Kids program? Jake: Every week, I go into the morning preschool classes at the 14th Street Y and tell stories. The stories I tell are all adapted from the texts the LABA Artists study – but heavily adapted to be both appropriate and, even more, meaningful for the children. First, I hope to help the kids become storytellers themselves. Second, I hope to tell the stories in a way that gives them something to wrestle with – as three and four year olds. Just this last week, for the first time, one of the kids took over the story I was telling and came up with a fabulous, much better ending!!! I almost cried. How do you tackle the difficult task of teaching two to four year olds ancient texts? Adapting the stories–many of which include “difficult” plot points and themes like murder, shame, sacrifice, fear, misogyny, heteronormativism, etc.–is definitely challenging and, for that reason, great fun. I mine each story for what I call “the wrestle,” the deep struggle a character experiences; and I adapt “the wrestle” so that it is something that the kids struggle with in their own lives. Aaaand, I try to make it funny. Tell us about this Sunday’s event- what makes it unique, and how does it add to the program? How can families use the wisdom of ancient text to enrich their lives? Tell stories! That’s the simple wisdom I have. Tell the stories. And, I always like to make clear that my version of the story is just one version. There are others. Maybe the kids can come up with some of the other versions themselves! This Sunday at 11am we’re putting together the Y’s favorite LABA Kids teaching artists, a great story, and delicious food and creating a multi-disciplinary family event. Through storytelling, dance and art, you and your child will experience an ancient tale where everyone refused to sit at a table with strangers. Can you imagine that? LABAKids favorites Jake Goodman, Julie Gayer Kris, and Eve Chwast help us explore what it really means to come together as a family for great food and true thanksgiving. To reserve tickets for the event, Click Here. 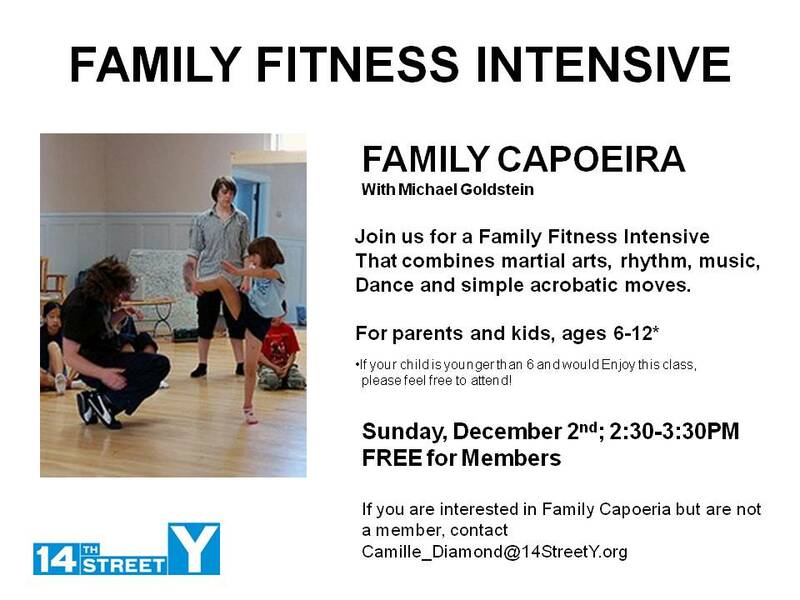 Family Fitness from a Friend of the (14th Street Y) Family! We’re reposting a magnificent blog written by one of our favorite fitness bloggers, Jeannine Trimboli of Real Fit Life. Jeannine lives in upstate New York, is a mom of 4 and a super example of how healthy living can fit sustainably into a busy, happy life. We often feature her workouts on Fitness Tip Tuesday and Workout Wednesdays. On the day after Hurricane Sandy, Jeannine posted this blog in the Times Union about the 14th Street Y and our Family Fitness Initiatives, a program still very near and dear to our hearts. In fact, though we missed our planned Nov. 4th Fitness Intensive, Family Track Day, we play on rescheduling it sometime soon! Meanwhile, get ready for Family Capoeira on Sunday, December 2nd at 2:30PM! Thanks so much to Jeannine for writing about us and what we’re up to. We’ll be bringing you more of her fabulous workouts on our Facebook and Twitter pages soon! It seems super appropriate that I write a blog about one of my newly found friends in Manhattan today. Since the storm hit their area so hard they are without power at the moment so I want to wish them and all of their neighbors safety and a speedy recovery. To be really accurate, they found me. Or at least Camille Diamond did. Camille is the Director of Community Engagement and Communications at the 14th Street Y and she reached out to me a while back asking if I would be interested in collaborating on a family fitness campaign. As a mom of four, and fitness professional, who often writes about the importance of making fitness a family affair, I was on board right from the start! We have so much influence over our kids. The habits we instill in them at a young age carry over into their adult lives. I know my kids understand that healthy eating, fitness, and other self –nurturing habits are topics that I am very passionate about. Now that response made me laugh a lot. It also made me very happy. I want my kids to see me fitting fitness into my life and making it a priority. I also want them to see it as something fun and cool. Just like us adults, kids are all different. They like different types of activities and sometimes you may have to experiment a little before you hit on something that gets them enthusiastic about fitness. I love the approach 14th Street Y is using. They are literally experimenting with new programs right now and trying to find out what kinds of parent – child activities are the most successful. food provided at the event was equally healthy. Instead of the usual cupcakes and pizza, they provided sushi and gluten free granola. The 14th Street Y also creates time that specifically caters to families within their facility. They have family swim seven days a week and family basketball court time every Saturday. In addition, they are offering special fitness intensives for families the 1st Sunday of every month. Their first one was Family Yoga on October 7th, from 2:30 – 3:30. I think all of this is great. Instead of having the kids hang out in a child care room while mom and dad “go work out”, this allows kids to be engaging in fitness activities right along side with them. I think that sends a powerful message to kids. Fitness is not something we have to wait to participate in “when we are old enough”. As parents and as communities, we need to be engaging our kids in activities on a regular basis. If you need to get a workout in, great! Take your kid with you! If you don’t think you can get sufficient exercise with a child at your side, then maybe it is time to rethink what you consider REAL exercise. I know my kids LOVE to have races. They like push up challenges. They also like to watch me lift weights. I also let them lift the weights that are appropriate for their age. Safety first, always! Kids feel really special when we allow them to see a glimpse into our world and when we make them feel like they are special enough to be a part of it. That in itself can make a huge, positive impact. Not to mention, it does oodles of good for their confidence! So, if you don’t live close enough to the 14th Street Y, that’s okay! You can make up your own great activities.